T-Mobile says the update will drop for all users sometime between yesterday and February 8th. 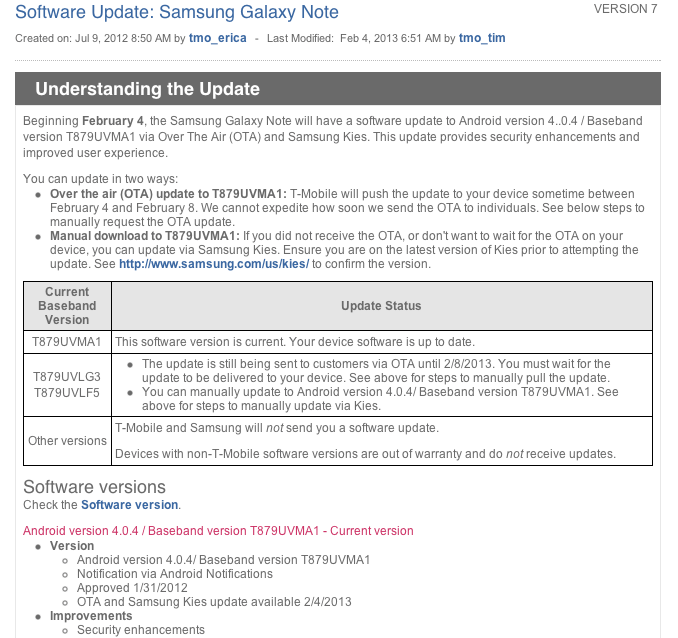 If you’re an Original Galaxy Note owner and you’ve received this update, we’d love to hear about any changes you spot. Otherwise, hit the T-Mobile support link below for instructions on how to manually update the software if you just can’t wait for the OTA notification. It’ll be available OTA or via Kies. Is the galaxy note going to receive jelly bean? This is probably to kill the LTE hardware hidden in the phone. It broke my play store app. I’ll reboot and see if that fixes it. Had to uninstall the updates and then reinstall them. Pocket Planes doesn’t work either now lol. Everything else seems fine. I can’t tell that anything at all was changed. No differences in the menus or look. The Note 2 is on 4.1. Ice Cream f*#king Sandwich?? Why? Key Lime Pie is rumored to be out later this Spring… This update is absolutely worthless. HvornÃ¥r kommer den jelly bean til note ? Already have ver 4.0.4 on my note. But yet it keeps asking me to update. WHY. If Tmobile is forcing this down our throats, I have a suspicious feeling its not in our best interest to update. OK. Against my better judgement I updated my phone. The only difference I can find and I looked are security certificate updates to the stock browser. How are the other carriers in updating their older phones? This is my second tmo phone, first one was the vibrant. I felt that both tmo and Samsung dropped us vibrant owners in favor of the next favorite phone. Now I fear the note 1 is the next vibrant. I understand that I can root the phone and do it myself but I didn’t pay (or paying still) to possibly brick the darn thing. So I am curious how are the othe carriers at upgrading their devices. my note already got 4.0.4 so whats this? Dont do it. Your device will not support Adobe flash player like it used to and you will lose the anlbility to view certain videos!!! !